The February State and Regional Employment and Unemployment report released today by the Bureau of Labor Statistics was another sign that the economy is headed in the right direction. While unemployment is still above pre-recession rates in 39 states and the District of Columbia, the number of jobs is growing and at a faster rate than a year ago in nearly every state. From November 2014 to February 2015, 48 states and the District of Columbia added jobs, with Idaho (2.0 percent), Utah (1.8 percent), and Colorado (1.1 percent) experiencing the largest gains. While states benefiting from the shale oil and gas boom—primarily North Dakota—have received the most attention for their job numbers, these three states, along with their Northwest companions Washington and Oregon, have seen notable job growth recently. They have combined steady gains in healthcare with more recent upticks in manufacturing and construction, to realize substantial job growth over the past year. 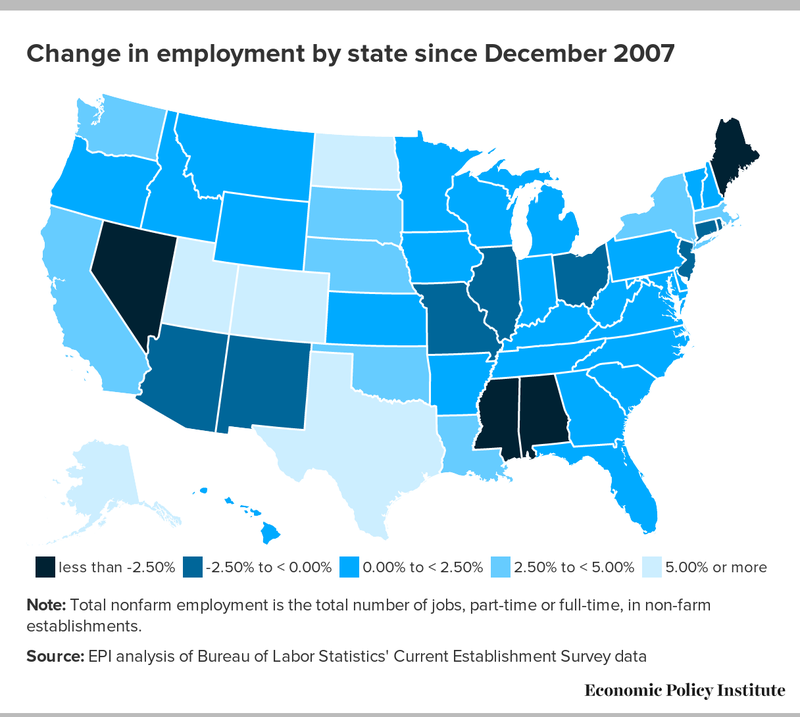 It is important to also note that these states, in contrast to much of the rest of the country, chose largely to either preserve or expand state and local government employment in the wake of the Great Recession. 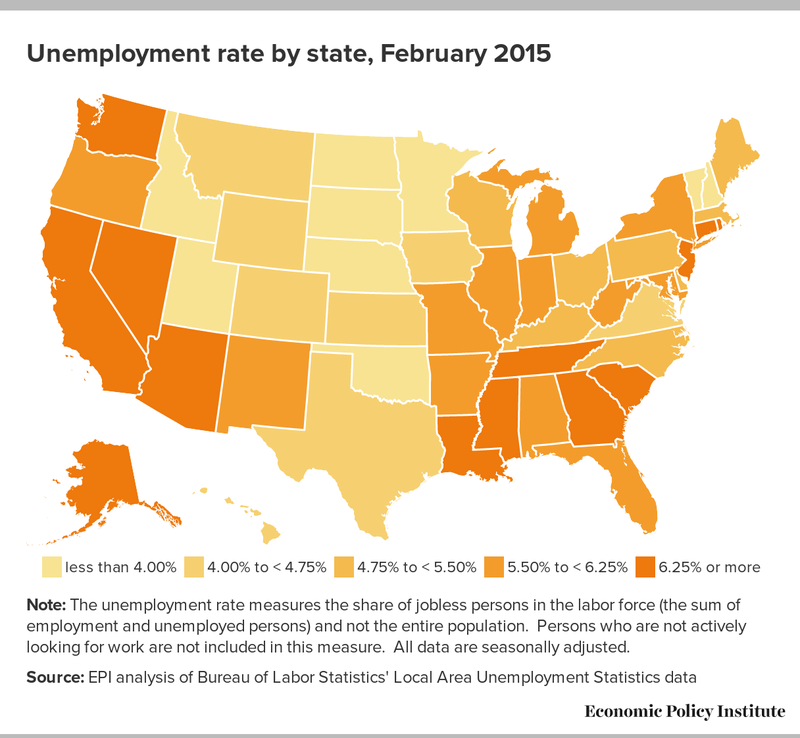 Over the same period, unemployment rates fell or remained unchanged in essentially all states. The largest declines in unemployment were in Oregon (-1.0 percentage points), Rhode Island (-0.6 percentage points), Idaho (-0.6 percentage points), and Michigan (-0.6 percentage points). With state job markets moving closer to more normal conditions—which, unfortunately, is not necessarily indicative of adequate job options, particularly for minority workers—the central challenge for the country remains stagnating wages. For nearly four decades, despite a growing economy and rising productivity, wages and incomes for the vast majority of Americans have remained flat. Policymakers at both the national and state level should adopt EPI’s Agenda to Raise America’s Pay, so that future periods of economic growth also generate robust wage growth and ensure that America’s prosperity is broadly shared. Note: The unemployment rate measures the share of jobless persons in the labor force (the sum of employment and unemployed persons) and not the entire population. Persons who are not actively looking for work are not included in this measure. All data are seasonally adjusted. Note: Total nonfarm employment is the total number of jobs, part-time or full-time, in non-farm establishments.